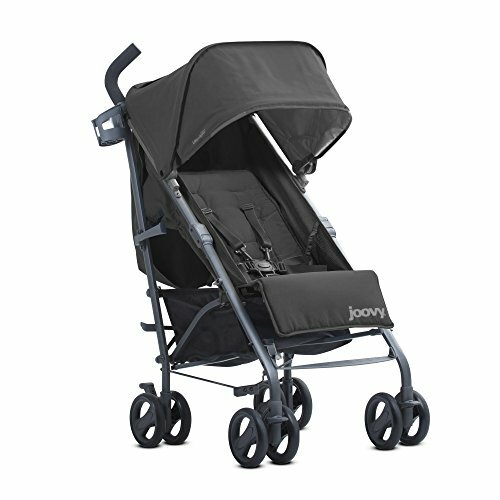 The new Jody Groove Ultralight Umbrella Stroller is newborn ready. The new seat has a deeper recline and a bassinet mode to accommodate newborns and children up to 55 lbs. The Groove Ultralight features a new soft brushed fabric that is water resistant and a UPF 50 canopy for sun protection. We have added a second parent cup holder and upgraded the wheels making it easier than before to push and maneuver through narrow spaces. An improved 4-wheel suspension and adjustable footrest makes the ride more comfortable. Two in-seat mesh pockets keep bottles, sippy cups, snacks or toys within reach. While the peek-a-boo window allows you to keep an eye on baby at all times. Feel like going out for an after dinner stroll? The Groove Ultralight has safety reflectors that will illuminate at night. A zippered pocket for your keys, phone and valuables is included. When not in use, the Groove Ultralight folds down easily and is able to stand on its own. It is great for travel weighing less than 14 lbs and includes a carry strap that fits comfortably on your shoulder.